Desert planets are still the worst to live on. Portion quarters make for a quick and easy breakfast. Riding down a sand dune is totally rad. Lightsabers are still cool and sometimes they can talk to people. You should never give up, even if a really scary guy wearing a black robe is chasing after you with a red lightsaber. If your friends are being chased by bad guys, you should hit them with your big stick. If you don’t have a big stick to hit bad guys with, you should probably get a big stick to hit bad guys with. When in doubt, just use crazy Force powers to solve problems. It works like a charm every time! Ponytail mohawk hairstyles are super sweet. Being trained by Luke is THE coolest. Yes, Rey is one clever cookie and if your little girl is smart too, then maybe it’s time for you to help her begin her own Jedi training. The first thing is first though. She needs this super deluxe Rey costume from The Last Jedi. 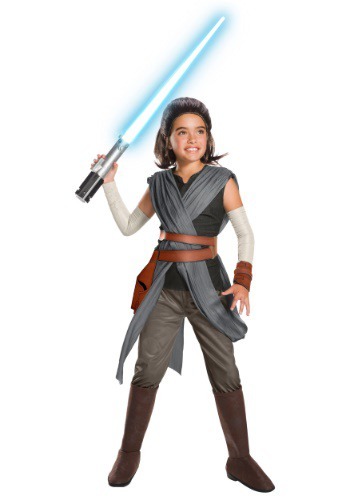 The costume comes with robes that look just like the ones worn by Rey in the movie, so your girl will be ready to undergo her transformation into a super cool hero from the galaxy far, far away. Also, it gives you a reason to dress up like Luke Skywalker this year, so there’s always that! A hit at the Star Wars themed Father Daughter dance! My granddaughter loved her Rey costume for the Father Daughter dance. The dance was Star Wars themed and the costume surpassed her expectations. Perfect fit, amazing detail, she loved it. I loved the quality and the price. Your site is my go to for special events and great costumes!! !